Pictures of Bass Mean Never Having to Say, "It was this big, really!" I take pictures of bass I've caught, mostly any over two pounds, and keep them as part of my fishing log. Even hang some up in my man cave. I keep my pictures with the data I record of each catch in a fishing log book. Over time I've built a nice historical record of trends that increase my odds of finding bass any season. Plus, combining these pictures of fish, smallmouth bass pictures and pictures of largemouth bass specifically, with my fishing log book makes a nice book of memories. "Where is My Crying Towel?" You've hooked what you're sure is a hawg. She's pulling hard, heading for deep water. No matter what you try you can't turn her. You can't get her up. She's running for deep water and you're trying like hell to control her. Don't horse her. Keep your line tight and loosen your drag slightly. Good. That's Good. Drags whining. Then, suddenly, the tension on your line eases. Uh oh, she's coming up. She breaks water, flips but stays on trying desperately to spit your lure right back at you. To no avail. Your work her slowly tiring her out till she is beside the boat. You slip your hand under her belly and lift her in the boat. Probably should have used a net but your excitement to land her got the best of you. You grab your scales. Hot damn, almost six pounds. Your personal best. Then you realize you have no camera. You're left with, "Really, she was huge, right at six pounds. Really, I swear!" If the above has ever happened to you that's sufficient justification for investing in a small digital camera with which to take pictures of bass you catch. I know, the thrill is in the catch. But life is memories and if you're like me some of my most pleasant are those made bass fishing. A photographic fishing log book serves to help you find bass and feeds the soul as you age. Plus, there is something to be said for bragging rights. While there are many cameras on the market in every price range my suggestion would be a moderately priced digital camera, like the one I use, the 10 mega pixel Canon PowerShot A 1000IS, or if you're prone to clumsiness, perhaps a disposable camera. Most outdoor pictures on this site (at least all I took) were taken with the Canon PowerShot. It's small so easily fits in any shirt or pants pocket and is easily used as a point and shoot camera with little settings adjustments, though it has numerous other capabilities. When fishing with a buddy each can take pictures of the other. But what about when you're alone? No problem. 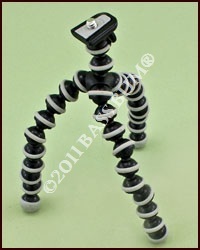 What I use is the flex arm camera tripod shown. This little device easily affixes to most chair seats, windshields, steering wheels or depth finders and is great for taking pictures of bass when you're fishing alone. After landing your bass put her in the live well, quickly place your flex arm tripod (I usually put it on the rear seat), retrieve your bass, click the shutter (set for 10 second delay) and take your position. After the picture is taken you're ready to immediately release your bass. Try to remove her from the live well only once by getting everything ready for your photo before removing her. Repeatedly putting her in and taking her out will severely stress her to a point that she is weakened and may die days or even weeks later. Catch and release has done wonders to preserve the populations of these bass we all love to catch. However, much damage is done to released fish by improperly handling them when landing and photographing them. 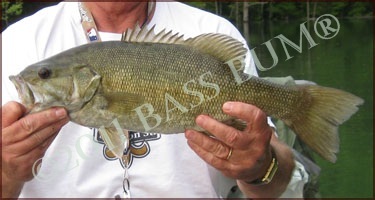 Getting pictures of bass should be done quickly and while handling the bass with care. Here are a few important features of handling a bass so they suffer no damage and are healthy when released. It's best to handle your catch with wet hands to help preserve the slim coating. Grip the fish with your thumb inside the mouth and your fingers locked on the outside of the mouth. Place your other hand beneath the rear of the fish just forward of the tail to lend support to its body and reduce stress on its jaws. Don't lift it out of the water or hold the fish by the lower jaw in a vertical position. This can dislocate or break the jaw, especially if it's a big bass. A broken jaw means it will not be able to eat. If it can't eat it will not survive. Handle the fish only when putting it into a livewell or holding tank. Do not keep the fish out of water as it must be in water to breathe. The longer it is out the greater the stress it will suffer. Something many anglers don't realize is that the eyes of a bass can suffer serious damage if allowed to dry out. Another reason to have them out of water a minimal amount of time. Yea, yea, I know. The guy in the picture at the top of the page is holding that bass vertically by the jaw, not supporting it horizontally. That knucklehead is me and even I sometimes forget. So ignore that guy and try to handle all bass with great care. We want them here in the future for us, our kids and grandkids. The picture above is the correct way to hold a bass. Support its belly to avoid damaging its jaw. If you hold it by the jaws only and do injure its jaw as a consequence it will not be able to feed once released. You will have killed it despite practicing catch and release. Send us pictures of bass you've caught. 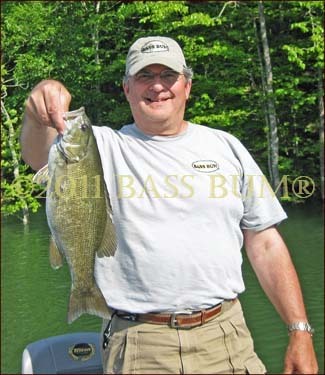 We'll add you to the Bass Bum® My Fishing Pictures gallery so you can compare yourself to others.